A common cold medicine containe pseudoephedrine. More often than not, problems in a democracy are best addressed through a combination of policy and community action. In 2017, following years of rising meth production in Maine, our lawmakers considered an overreaching and shortsighted proposal to require a prescription for pseudoephedrine. As retailers and pharmacists on the front lines of this debate, we worked to defeat this proposal, as it would have been harmful to consumers. Ultimately, lawmakers decided that the rise in meth production would be best addressed through enforcing laws already in place and by our community working together to craft smart solutions. The proposal to require a prescription for pseudoephedrine, which is found in everyday cold and allergy medicines, came in response to record-high levels of meth lab busts in 2016. 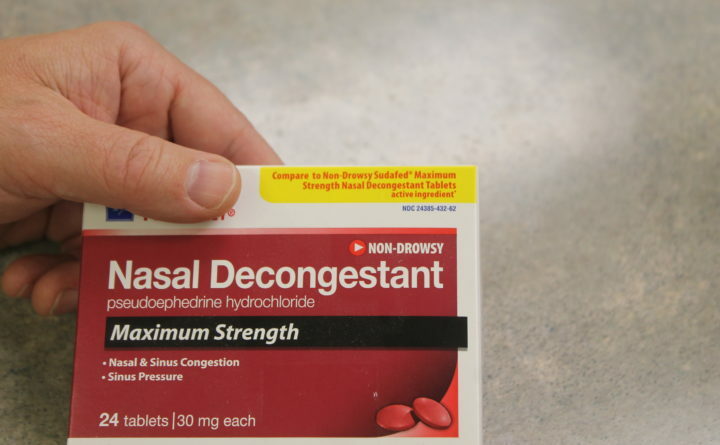 The intentions behind the bill were well-meaning, as pseudoephedrine can be used to make meth, but the reality is that Maine already employs restrictions on the amount of pseudoephedrine individuals can buy. A prescription requirement would have only hurt honest, law-abiding consumers who depend on these medicines. In Maine, the amount of pseudoephedrine individuals can purchase is restricted through the use of the National Precursor Log Exchange. This system tracks who buys pseudoephedrine and how much they’re buying. In 2017, it was successful in blocking more than 6,000 boxes from getting into the hands of criminals. Coinciding with the success of this system, there has been a reversal in the trend of increasing meth lab busts. The Maine Drug Enforcement Agency recently reported that meth lab seizures were cut in half last year — from 127 incidents in 2016 to just 56 in 2017. The laws currently in place are clearly working, but there’s more that can be done to bring an end to meth production in our state. For several years, we’ve known that local methamphetamine criminals have learned how to “cook” homemade meth by mixing the safe and effective medicine ingredient pseudoephedrine, often acquired by “smurfs,” with other ingredients to make meth to use or sell. “Smurfing” is when another person purchases pseudoephedrine for a meth cook. This is also a crime. In response to calls for community action, the Retail Association of Maine and Maine Pharmacy Association have launched an anti-smurfing campaign to inform the public. This campaign aims to educate Mainers about the dangers and criminal consequences of smurfing to aid and abet meth criminals. As pharmacists and retailers who recognize the need for community solutions, we’ve joined forces with lawmakers and law enforcement to develop this campaign to increase public awareness about the criminal act of smurfing. While meth cooks understand they can go to jail for their actions, those who smurf for payment may not know it can lead to prison time. It’s our goal to ensure that all Maine residents understand that smurfing carries serious legal consequences. Equally important is the fact that smurfing fuels the state’s meth problem. While pseudoephedrine limits have been effective, smurfing presents another avenue for criminals to produce and distribute this terrible drug. Mainers understand the severity of the meth issue, and we’re confident that we can continue the progress that’s been made by legislators and law enforcement by educating Mainers on the dangers of smurfing. It’s a testament to democracy that members of the community can come together to play a role in addressing serious issues and making our communities safer. We’re encouraged by the confidence our legislators have shown in Maine’s communities to do their part in resolving this issue. We’re proud to join the fight to keep meth out of our state and encourage all Mainers to spread the word about the dangers of smurfing. Cassandra Parsons is the president of the Maine Pharmacy Association and an assistant professor of pharmacy practice in the School of Pharmacy at Husson University School. Amelia Arnold is a board member of the Retail Association of Maine and a clinical pharmacist at Community Pharmacies.